Facade joints are subject to extreme climatic and physical stresses. Heat, cold, rain, sun, wind and movement of building components are factors of influence which must be taken serious and which require the use of special jointing materials. Our ISO³-FACADE SEALING SYSTEM offers you a range of system products for flexible use in different versions and dimensions, every single one of which has been designed to meet the special demands made on a professional facade seal. 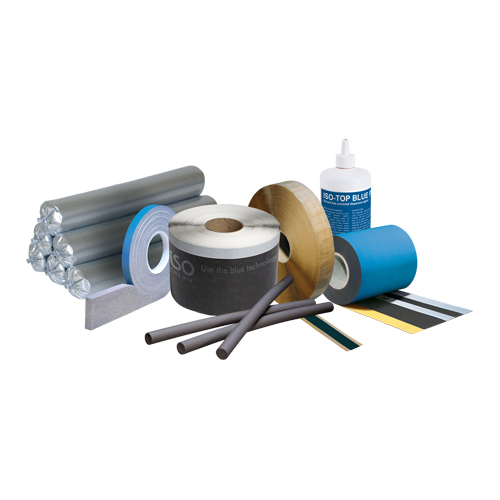 ISO-BLOCO 600 „PREMIUM EDITION“ or ISO-BLOCO 300 „PREMIUM EDITION“ pre-compressed joint sealing tapes are the ideal choice for the professional sealing and refurbishing of the external wall joints in building facades. Both system products are suitable for sealing the horizontal and vertical facade joints between prefabricated concrete elements and facade components against driving rain. See the relevant product pages for more details. For metal façade constructions, the system with ISO-CONNECT INSIDE EPDM and ISO-CONNECT OUTSIDE EPDM offers two flexible sealing films for the internal and external sealing of window, door and facade joints. As an alternative to the self-adhesive versions, the sealing films can be securely attached to the substrate using ISO-TOP FLEX-ADHESIVE XP or ISO-BUTYL. See the relevant product pages for more details.